Music seems to emanate from a composition. 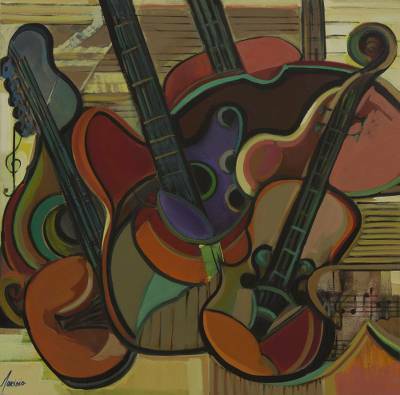 By Marisia Salomao, it superimposes violins and guitars at rest upon one another in a colorful ambience of memories and imagination. Titled "Recordando grandes momentos" in Portuguese. You can find 'remembering Great Moments' by Marisia Salomao in paintings categories such as Dance and Music Paintings, Cubist Paintings and Acrylic Paint Paintings. Enjoy exploring these sections for other Novica treasures.